This is simple yet a remarkable craft! These glitter magnets add sass to your fridge, work station, or even aluminium cupboards. Hang them up separately, or to hold up your pictures, quick notes, etc. Use the gold spray paint, to cover the magnets in 2-3 coats. Make sure to cover the sides. Let them dry! Nicely layer the craft glue, on the surface of the magnet. Use the entire area. 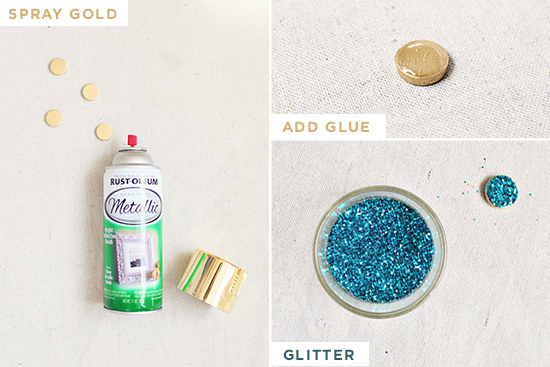 Dip your magnets in glitter. Shake your magnets to remove excess glitter. Gently pat the glitter with your finger so that it forms a uniform circular surface. Dip your magnet in glitter once again. Repeat the steps, you’ve performed previously. Now, spray the clear coat enamel (2 coats) on your magnet, in order to prevent the glitter from flaking or from coming off.